Snippets of Jack: "We're All Men Of Our Word"
"We're All Men Of Our Word"
Jack: "She's safe, just like I promised. She's all set to marry Norrington just like she promised. And you get to die for her, just like you promised. So we're all men of our word really, except for, of course, Elizabeth who is in fact a woman." Doesn't that sound appealing? That was exactly what Will had in mind. That's great news! Isn't it? Yay! Will learns that the love of his life is going to marry some weird British soldier. But at least he won't have to witness it, because he'll be dead! Happy Day. But of course, that doesn't happen. Elizabeth does remain safe, and a woman. Will lives, and become engaged to Elizabeth. 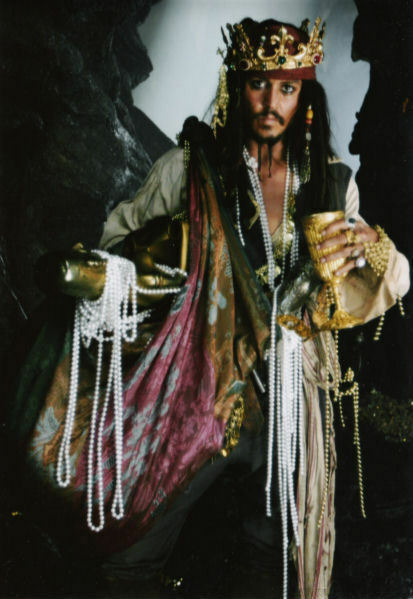 And Jack gets a bunch of crazy treasure, before he gets arrested, again. So what really happens is, Elizabeth is safe as Jack promised. She's all set to marry Will, as she promises. Will doesn't die... which he's probably happy about. So in the end everyone is men of their words, except for of course, Lizzie, who is in fact a woman.